I absolutely love the smell, I love anything that smells of lavender. Not so sure I could smell the jojoba but once again I’m not very good at picking out scents. I really didn’t like the bottle though, I found it really hard to squeeze the product out with only one hand. Each time I used it, it was harder and harder to get out. Would this stop me from repurchasing? I’m not sure. My hair is really dry at the ends, it really just needs a trim but I don’t want to get rid of the length, so I like to use a thick conditioner. This one is just too light for me but would be perfect for someone with fine or oily hair. For me £7.49 is quite expensive for a conditioner which doesn’t quite work for me so I wouldn’t repurchase. 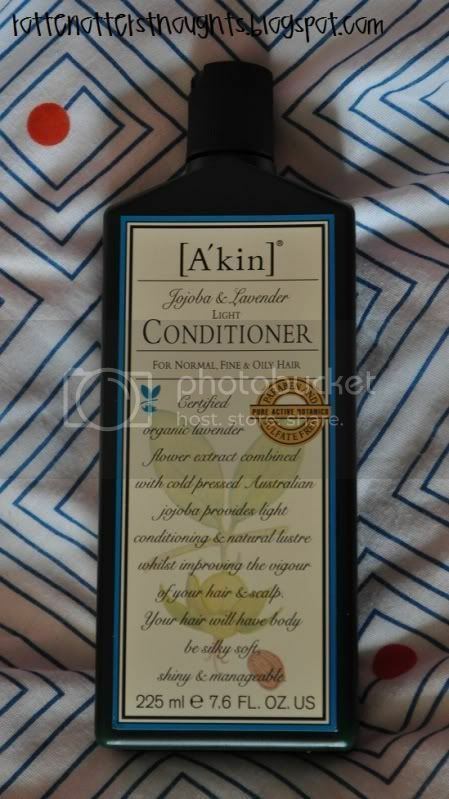 I would be interested in trying the A’kin conditioner for dry hair to see if it works better for me though. You can find more information about this conditioner here.